Our Professional Popcorn Ceiling Removal Services Can Add Value To Your Home In No Time! With Ceiling Specialist you know you are getting quality craftsmanship with your popcorn ceiling removal and/or home remodeling. We take pride in our work and our customer satisfaction. With our family owned and operated, ceiling and water damage repair services, we will get your home looking great in no time. We also have competitive pricing and will try to beat any bid you have from another contractor. Whether you need water damage repair, popcorn ceiling removal, or just want to make some home decorating improvements, Ceiling Specialist has you covered. We have the experience and know how to complete any home remodeling and renovations. Popcorn Ceiling Removal Services – Our popcorn ceiling removal allows you to have the ceiling you want with as little hassle as possible. This service includes: removing and covering furniture, scrape acoustic ceiling, retexturing, drywall repairs, and painting. Home Remodeling – Our home remodeling services can spruce up any home and bring added value to your investment. The home remodeling services include a wide variety of renovation and customization services, including painting, ceiling and wall texturing, recessed lighting, ceiling fans, crown molding, baseboards, and more. Water Damage Services – Every year many homes experience some kind of water damage, many the result of some type of plumbing failure, roof leak, appliance failure or natural disaster like flooding. When water damage occurs, it is important that you locate a company that is well-trained and has the necessary restoration equipment to completely dry your home as quickly as possible. Water damage is progressive and items that could be restored within the first 48 hours of initial damage may not be restored if emergency response is delayed. Our immediate response team of certified and experienced Water Damage Restoration Technicians use the newest up to date equipment to perform the tasks needed to complete the job. After the dry out we have you covered by doing all the the necessary repairs to get you back in your home quickly. You Won’t Have To Worry About Your Home Renovation Project With Our Superior Craftsmanship And Exceptional Customer Service. Our staff is dedicated to great customer service and building strong, lasting relationships. We take pride in using quality material and building exceptional home renovations with our professional ceiling specialists and their excellent craftsmanship. We work hard to meet and exceed your expectations in all areas of a project, including customer service, craftsmanship, affordability, quality materials, and construction. We will get the job done in a quick, efficient, and clean manner. Ceiling Specialist is part of the Better Business Bureau with an A+ rating. We believe in holding ourselves to a high standard and work to ensure that every customer is satisfied with their ceiling repairs and home renovations. Call Now! Ask About Our Lifetime Warranties! (858) 568-2594 Free On-Site Estimate! We are proud to be San Diego’s popcorn ceiling removal and home remodeling contractor servicing areas in the city of San Diego, Alpine, Bonita, Bonsall, Borrego Springs, Bostonia, Boulevard, Camp Pendleton, Campo, Cardiff, Cardiff by the Sea, Carlsbad, Chula Vista, Coronado, Crest, Del Mar, Descanso, Dulzura, El Cajon, Encinitas, Escondido, Fallbrook, Guatay, Imperial Beach, Jacumba, Jamul, Julian, La Jolla, La Mesa, Lakeside, Lemon Grove, Leucadia, Lincoln Acres, Mount Laguna, National City, Nestor, Ocean Beach, Oceanside, Olivenhain, Pacific Beach, Pala, Palomar Mountain, Paradise Hills, Pauma Valley, Pine Valley, Potrero, Poway, Rainbow, Ramona, Ranchita, Rancho Bernardo, Rancho Santa FE, San Diego (County Seat), San Diego State University, San Luis Rey, San Marcos, San Ysidro, Santa Ysabel, Santee, Solana Beach, Spring Valley, Tecate, Valley Center, Vista, and Warner Springs. We service other cities that are not listed. We pride ourselves in serving the following cities and zip codes throughout San Diego County, California: 92101, 92102, 92103, 92104, 92105, 92106, 92107, 92108, 92109, 92110, 92111, 92112, 92113, 92114, 92115, 92116, 92117, 92119, 92120, 92121, 92122, 92123, 92124, 92126, 92127, 92128, 92129, 92130, 92131, 92132, 92133, 92134, 92135, 92136, 92137, 92138, 92139, 92140, 92142, 92145, 92147, 92149, 92150, 92152, 92153, 92154, 92155, 92158, 92159, 92160, 92161, 92162, 92163, 92164, 92165, 92166, 92167, 92168, 92169, 92170, 92171, 92172, 92174, 92175, 92176, 92177, 92179, 92182, 92184, 92186, 92187, 92190, 92191, 92192, 92193, 92194, 92195, 92196, 92197, 92198, 92199. We service other zipcodes that are not listed. Our popcorn ceiling removal includes removing and covering furniture, scraping the acoustic ceiling, retexturing, drywall repairs (if necessary), and painting. Ceiling Specialist professionally trained staff provide you with great customer service and a satisfaction guarantee. Not only do we care about our customers, we also take pride in our craftsmanship. We value your business and do our best to build strong relationships for future home remodeling needs. 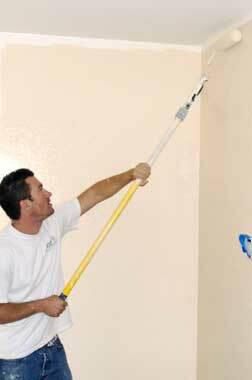 Our house painting services include removing and covering furniture, adding textures, and painting. We keep your furniture and possession safe and clean by removing and covering them. We also use quality paints that won’t fade with our interior and exterior priming and painting services. We will have your home looking great and add value to your home investment. Whether you are remodeling or just redecorating, we can give your home the TLC it needs. We have a variety of ceiling and wall textures to choose from including knock down spray texture, skip trowel, and Santa Fe textures. Our service of texturing and painting your walls or ceilings with an elegant hand skip trowel texture or a texture of your choice. Light hand skip trowel texture is a popular textures for new homes and home remodels. It not only enhances the appearance of your ceilings, but it provides a definite selling feature as well as a valuable upgrade when selling your home. Are you bothered by the unsightly water damage to your ceiling or walls? We are IICRC Certified to handle water damage drywall repairs and restoration. Our professional water damage restoration services include removing drywall, repairing walls and ceilings, installing fixtures, replacing drywall, and painting. We will have your home restored to it original beauty in no time. You can trust us to the job right and expect quality home restoration services. "The Ceiling Specialist did an excellent job repairing the holes in my ceilings after having my home rewired and removing that ugly popcorn off my ceilings, I was amazed when I saw the finish texture they applied to my ceilings and walls. They really exceeded my expectations. They were very professional, easy to work with and honest. I will not hesitate to give them a call as soon as i am ready to drywall my garage." "You guys are top notch. You should be proud of working wih such a great crew. The quality of the work at our home is perfect. I am very impressed with how clean you left the house. Your crew's quality of work is off the charts."